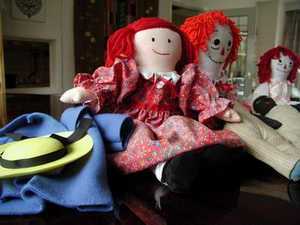 This pattern fits 15-inch to 18-inch fabric and vinyl dolls such as the 15-inch Dressable Madeline doll in this photo. For clothes to fit 18-inch American Girl and other historical dolls click here. The pattern to cut out the pieces is here. And, the page of sewing directions is here. For 18-inch dolls the skirt length would be longer. (The dress bodice and sleeve lengths are the same.) Click here for a page of photos of 18-inch doll dresses. For Madeline’s dress I’ve used red calico with a white eyelet fabric for the top of the collar. For decoration, I've top stitched a ¼” wide red cross-grain ribbon across the lower front of the bodice around the waist. For the tassel on the bib collar I've used red 6-strand embroidery floss. Here is a close-up of the collar detail. The skirt on the 15-inch doll is 6.5 inches long. Adjust the length longer for 18-inch dolls. Have fun making doll dresses! "Doll Making Techniques" - 21 detailed tutorials for making cloth doll bodies and costumes, plus patterns and instructions to make and dress the 12 inch (30cm) Anneke cloth doll. Fully illustrated 53 page ebook. "Doll Clothes Patterns" - Collection of patterns for clothes I designed to fit 18 inch American Girl, Corolle, Gotz Precious Day Dolls; 14-16 inch baby dolls like Bitty Baby and Baby Born; and 15-18 inch dolls like Sasha, Kathe Kruse play dolls and Magic Attic. Fully illustrated 35 page ebook. This content was written by Susan Kramer. If you wish to use this content in any manner, you need written permission. Contact Susan Kramer for details.